After eight months of unabated protests, "external engagement" has moved to the forefront of the debate on the Syrian uprising, underlines a conference organised by the Arab Forum for Alternatives, Hivos People Unlimited and the University of Amsterdam, held in Cairo under the title, “Emerging spheres of civil engagement in Syria”. The humbly-attended yet significant conference comes against the backdrop of Bashar Al-Assad’s statement made to Britain’s Sunday Telegraph on Sunday that an “earthquake” would follow in Syria, turning the country into “another Afghanistan”, if foreign intervention took place. The statement was made after another Friday of protests, where 12 civilians and 20 soldiers were killed, as reported by AFP. Steven Heydemann, senior advisor for Middle East initiatives at the United States Institute of Peace, focused on the topic of external intervention. Having entered its eighth month, the current state of Syria can be seen as a “war of attrition”; with a regime that has failed to end the national protest movement and an opposition that has demonstrated that it does not have the capacity to achieve its core objective of overthrowing the regime on its own. “We cannot overlook the extent to which the regime itself has been willing to go to extraordinary lengths to hold on to power, even at the cost of the economic future and security of the country,” Heydemann said. He preferred the use of the term of external “engagement” as a neutral alternative to “intervention”. 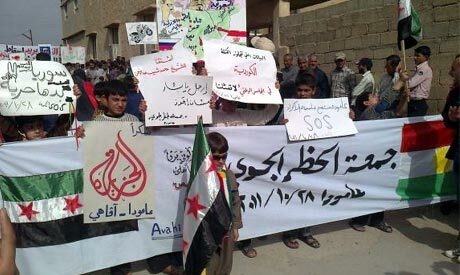 As the question over foreign intervention is problematic, Sallam Kawakibi, director of research at the Arab Reform Initiative Centre in Paris, stated that Syrian protesters have voiced the demand very clearly, holding signs in English that have explicitly called for foreign intervention. This has been echoed in last Friday's protests in Syria, where people called for the imposition of a Libyan-style "no-fly-zone" in the country. The Syrian National Council (SNC), a broad-based umbrella council currently under formation, with Bourhan Ghalioun at its head, seemed to recently leave open the possibility for some form of outside intervention — at least one that would focus on the protection of protesters. Kawakibi noted that this is a shift in the group's initial statement in August, articulated as the “Three no’s” — to foreign intervention, to armed resistance, and to negotiations with the Al-Assad regime. Responding to the embarrassingly impotent response of the international community, Heydemann made it a point to mention that the international system in the post-Cold War era has become increasingly more supportive of authoritarian governments. “International hypocrisy” is very much pronounced at the moment, comparing the Libyan case to the Syrian case, added Kawakibi. This was evident when the UN Security Council drafted a resolution against Libya, but would not apply the same stance to the Syrian case. Russia and China vetoed a resolution condemning the “grave and systematic human rights violations” of the Al-Assad’s regime. Additionally, regional allies like Hizbollah, Iran and Iraq, have given Al-Assad room to manoeuvre. What is interesting at the moment is the shift in the peaceful basis of the opposition on the ground within Syria. This is despite the fact that army defectors in the Syrian case are not as significant as was recently seen in Libya or Yemen. Kawakibi stressed that the "Free Syrian Army", made up of defectors, has to be distinguished from civilian protesters; a significant number of whom are now transforming the nature of the peaceful revolution into an armed one. This increasingly armed opposition must be watched carefully to see how it will develop, Kawakibi said. In an attempt to reflect on, as well as build on, the experiences of the Arab Spring, Amr Saleh, member of the Revolution Youth Coalition, talked about the role of internet activism and youth movements in the lead up to the Egyptian revolution. Amr Elchobaki, head of the Arab Forum for Alternatives, talked about possible post-parliamentary elections scenarios, with the Muslim Brotherhood’s expected significant influence. Mohamed Elagati, executive director of the Arab Forum for Alternatives, criticised the current state of civil society in Egypt as suffering from the “democratic transitioning process”. Civil society organisations, Elagati said, mainly comprised of human rights organisations, still work in the same way they used to prior to the revolution, in still aiming to embarrass the system (the Supreme Council of the Armed Forces) and raise awareness, as opposed to effectively and professionally carrying out their programmes in the transitional process. Drawing parallels between Tunisia and Egypt and Syria, in an attempt to share experiences, one point made was that the level of support for revolutions in the former two countries is largely not seen in Syria. “Syria will be a marathon,” Heydemann stressed.